Spring is swarming season! 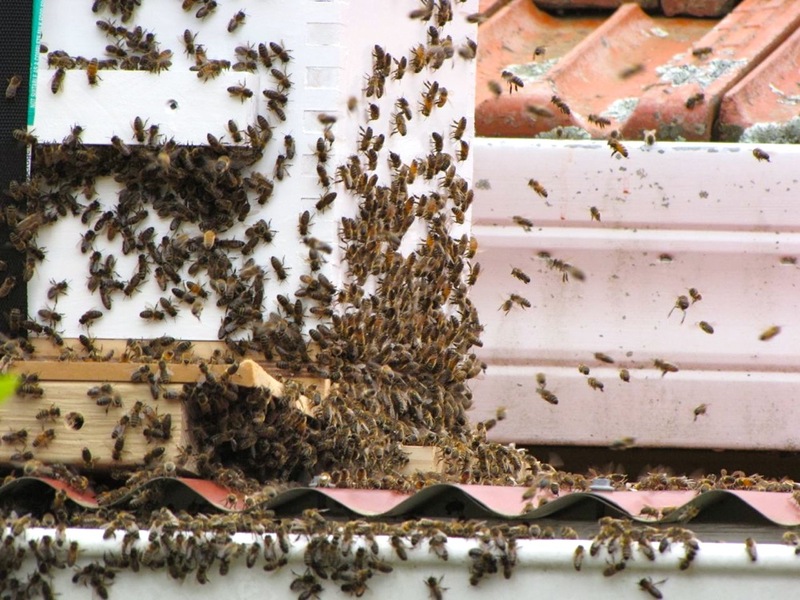 At this time of year, honeybee colonies that have either outgrown their available hive space or have deemed their hive unsuitable for whatever reason start taking off in search of a new home. 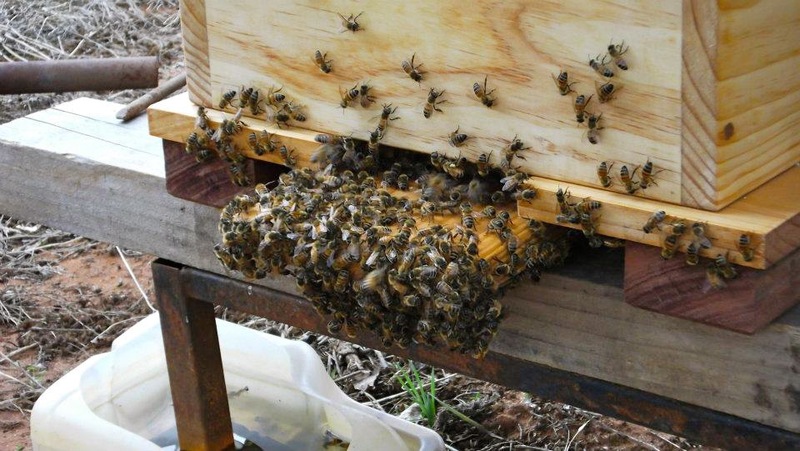 For natural beekeepers, it’s a great time to catch yourself a new colony. 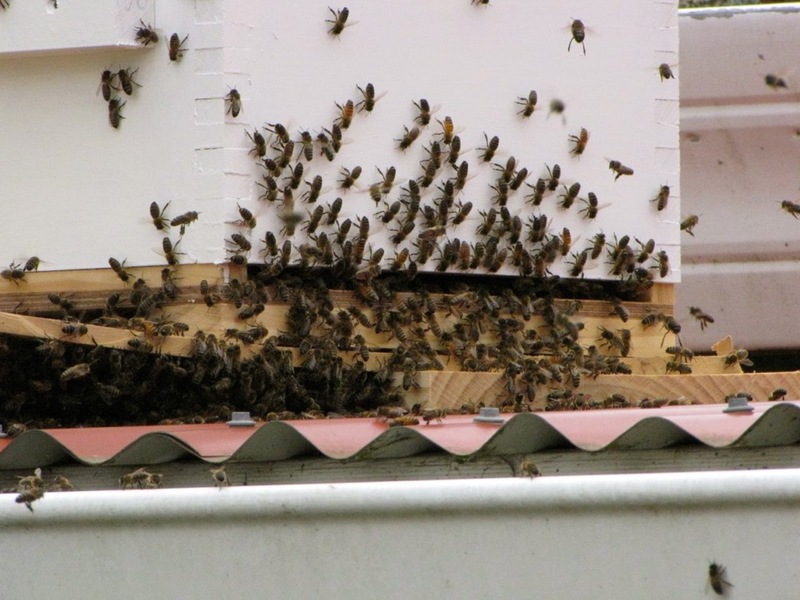 After a while, a swarm of bees duly arrived, filling the air with the living wall of noise that is a honeybee swarm at close range, and decided that Steve’s Warré hive would do as their new home. A day to remember! The next challenge was getting the hive from the roof to it’s final position in the garden. Apparently this stage went well, if causing Steve’s adrenalin to rise somewhat in the process, and the bees are now in their new home in the garden. 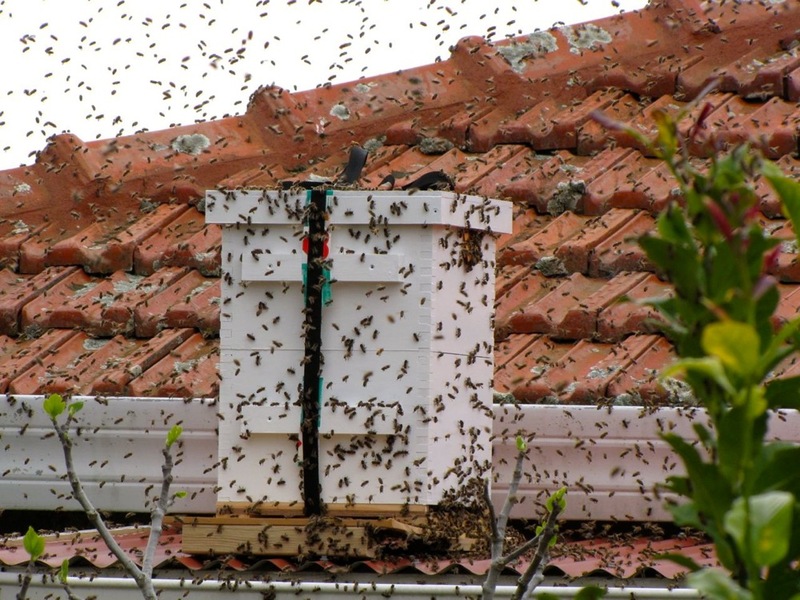 – Catching a swarm is a great way to get some wild and probably resilient genetics into your hive. Bees typically swarm when they are either from a very healthy or alternately a very unhealthy colony, but it’s usually the healthy type. – A swarm of bees usually has a queen in the middle of the cluster. In swarming mode, the bees are usually very gentle. All they care about is protecting the queen and finding a suitable home, and their limited energy is focused on those two tasks. – If you do find a swarm on a tree brnach or similar, you can ususally hold a box underneath it and give the branch a sharp knock, at which point the swarm will drop into the box. Place the box next to your ready-made hive, and see how you go. 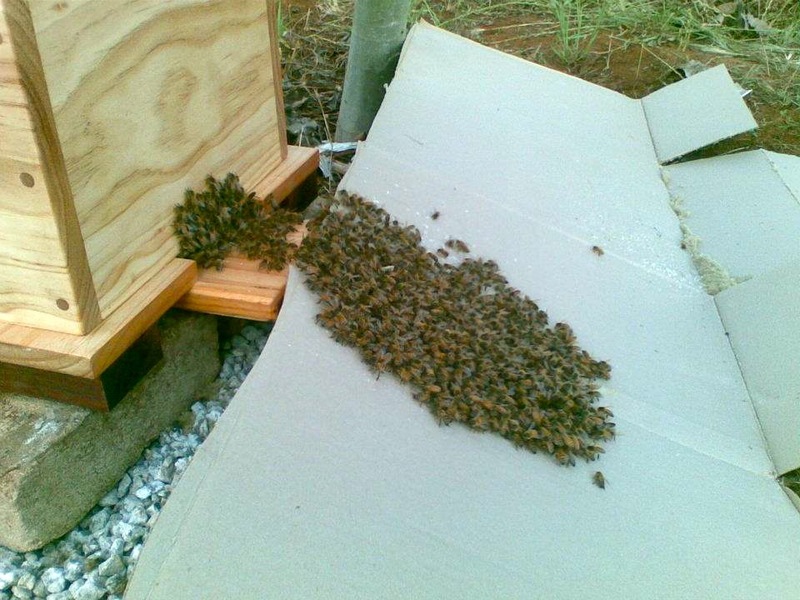 – If you’re not comfortable catching a swarm, you can buy packaged bees and shake them into a new hive. 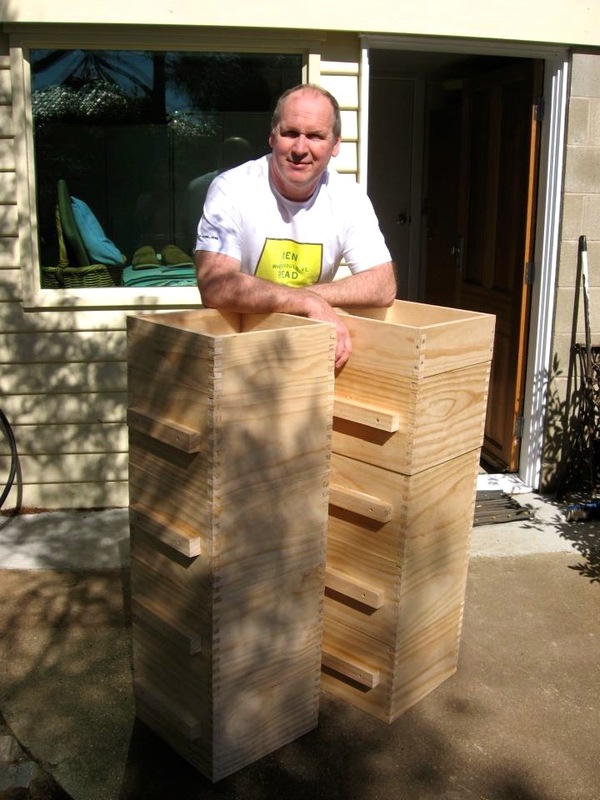 Or you could buy a nucleus hive from Tim Malfroy (a single Warré box of bees that has been split from a healthy Warré hive and cared for at Tim’s apiary) , but his waiting list is extremely long these days. – If you’re not up for it, don’t do it. Like every other aspect of natural beekeeping, catching and housing a swarm needs to be done with care and respect for the bees, with the beekeeper entering into the task fully aware of her/his responsibilities, and the possible outcomes. Then there’s our friend Paul Ward (Speedy). 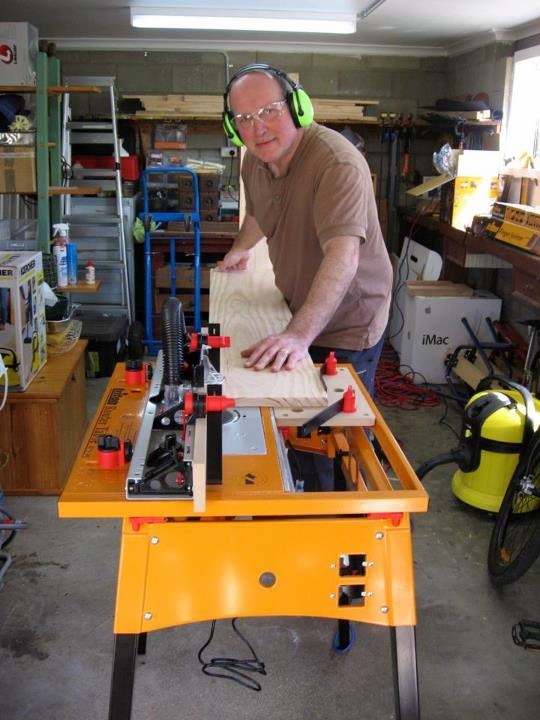 Paul is a blacksmith / green woodworker / bush mechanic, who knows more about trees, plants and fungi than anyone else i know. 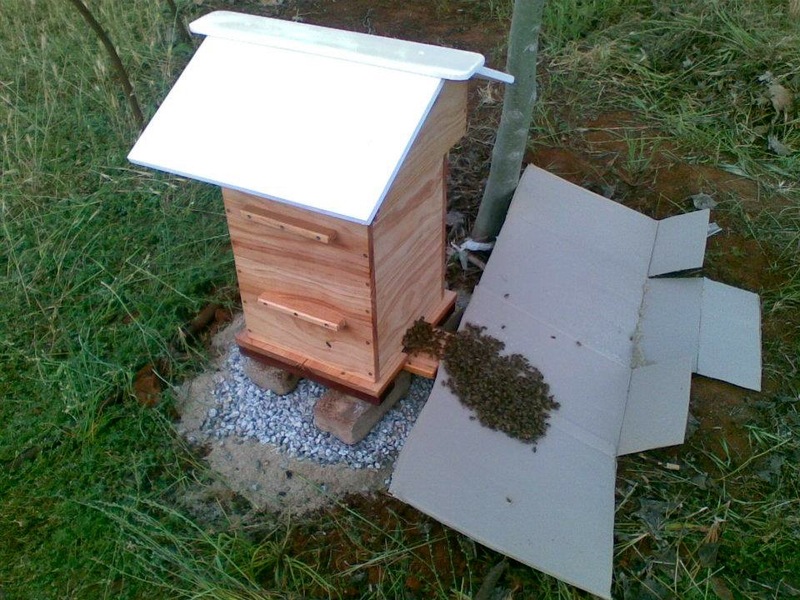 Paul was at Milkwood for a whole 2 days, saw our Warré hives, and then went home and built one. After which he promptly collected a swarm in a box and ran them into the hive. Some people make this sort of thing seem so easy. A can-do attitude will get you a long way with this sort of thing, though it helps to have deep powers of observation and ecological knowledge (like Speedy) to help your decision making process. Paul with his ‘viewing panel’ that he placed in the back of a warré box. The panel has wood to cover it the majority of the time, as the bees don’t want light in the hive and would otherwise cover the window with wax and propolis. A great way of checking what’s happening without invading the hive! 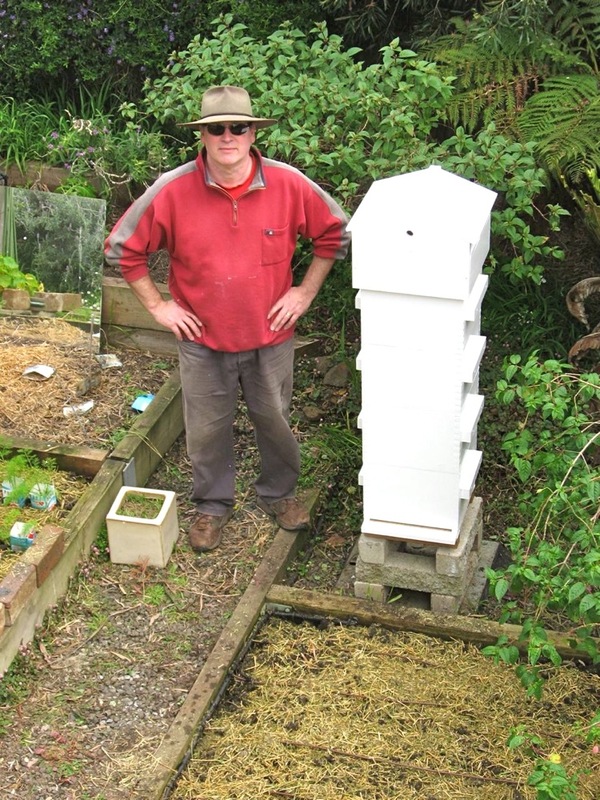 Tim Malfroy has adapted the original Warré plans slightly to produce optimal bee health in Australia conditions. 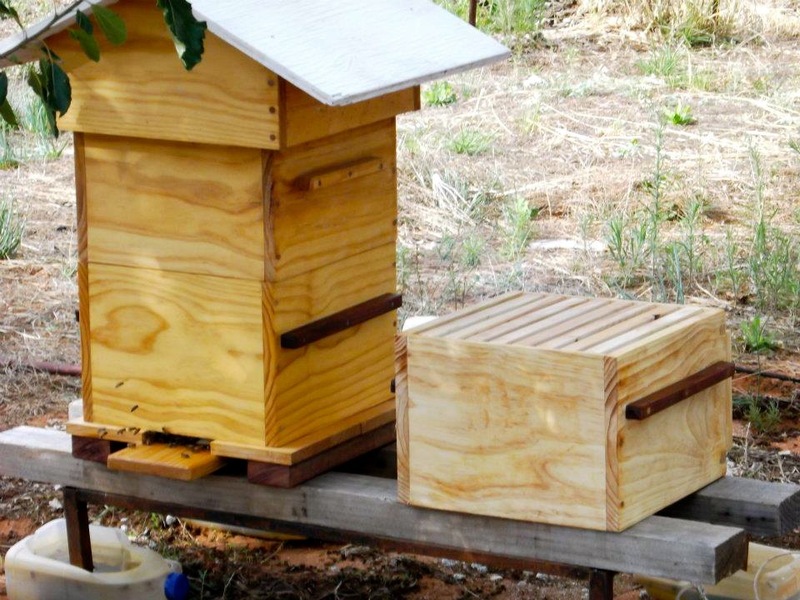 I believe there is a plan for Tim to release his Australia adapted Warré hive plans in an open source context shortly, in addition to the ethically and organically sourced/made Warré hives he currently builds and sells. We’ll keep you posted when they’re available. In the meantime, check out Tim Malfroy’s Natural Bekeeeping site. Tim is an exceptional 2nd generation beekeeper who, after growing up in a commercial apiary in the Hawksbury, has been advocating and developing Warré Beekeeping in Australia for 5 years now as a technique to ensure optimal bee colony health while still producing a sizable honey harvest for the beekeeper. Big thanks to Steve Williams and Paul Ward for the excellent swarm catching photos. 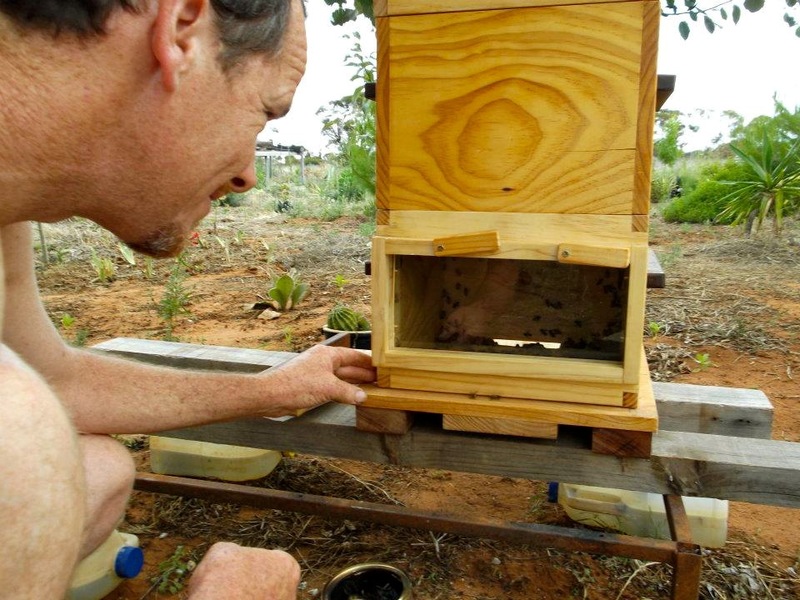 We run Natural Beekeeping courses with Tim Malfroy at Milkwood Farm and in Sydney, which are resulting in a growing Australian community of active and awesome Warré beekeepers. Hurrah! Great post, Kirsten! I was fascinated to see the bees running into Speedy’s hive. Tim told us about this method but I hadn’t seen it in action. Beekeeping is great fun but also an awesome responsibility, particularly in an urban context. I’d strongly recommend that anyone who wants to keep bees consider the Warré method, which is based on a thorough understanding of bees (the lifetime’s work of a master beekeeper, Émile Warré). Tim Malfroy is the only professional apiarist (as far as I know) practising this method in Australia, and it was definitely worth the trip from Geelong to Sydney to attend his course. I think it may be easier in a suburban context. Our garden is brimful of flowering plants year round (especially since we stopped ‘tidying it up’) and thus full of bees. I think this swarm probably came from the overgrown creek about 200 metres away. We used a swarm lure from here: http://honeybee.com.au/catalogue/page8.htm. The bees were very interested in the wax foundation (which I cut up to make starter strips), so that no doubt helped as well. Plus a bait hive with the right dimensions (50 litres i.e. 2 box Warré – with frames only in the top box) and the right spot (2 metres up on the veranda roof). Entrance facing east. The other bait hive we put on the water tank is lower down and was not nearly as popular. Wow – impressive! We waited all season last year for our lure (bought online) to catch us a swarm, to no avail, so bought a package last week. So lovely to finally have the hive populated after all this time. Only now I’ve forgotten everything I learned in my course with Tim…. I’m sure it’ll come back to you. Congrats on your bees. I tend my bees with a miniature donkey, named Penelope. Best of continued luck and success to you!